We had a wonderful time at the March Dinner Meeting. Two women from the “Sail Like a Girl” team, who won last summer’s Race 2 Alaska, gave a great presentation. Many a T-shirt was acquired from their nice assortment of Sail Like a Girl swag. They took us through the whole race, which was quite harrowing in spots, like sailing in total fog one night, doing seven plus knots, and hitting a log so hard it felt like the boat would surely be split open (Melges 32). But, no water came in. 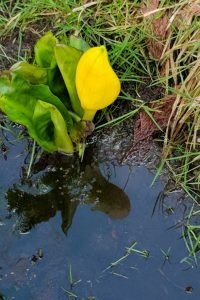 They slowed down and examined things with the first morning light, preferring survival to continuing in the pitch-black darkness at full speed or worrying about their position in the race. They explained their secret weapon, which was two stationary bike gizmos one of the husbands (an engineer) installed off the transom. Each bike turned its own propeller. Racing shifts on this boat not only meant helm duty and/or being on watch, but a regular shift schedule (seven women on board) on these bikes. With not a breath of wind, the two bikers going at it pretty actively could move the boat at 4-1/2 knots, which provided enough apparent wind that they could raise sail in a total calm and now get 5-1/2 knots out of her. Amazing! The Sail Like a Girl team is going to participate again this year, stressing that it’s not about “defending their title” but rather they’re seeking another life-improving experience by doing the race. Good stuff! We also paid tribute that evening to the many years of club membership and extraordinary contribution to the club made by Sam and Dave Krause. After 30 years of living aboard their boat, State of Mind, they are moving back to their home state of Oregon. They’re closing April 5th on a house near Prineville (east of Bend). It has a nice shop so Dave can continue building more musical instruments and Sam’s work allows her to live most anywhere. Sam and Dave grew up in Corvallis, Oregon – getting together there as a couple in about ninth grade. We presented them with a set of four stainless steel, stemless wine glasses, plus 17 bottles of wine that members brought for them, with thank you/Bon Voyage cards attached. We will certainly see them in Seattle from time to time, but they most likely won’t be attending Yellow Fest this year. By early May they should be fully off the boat and living in central Oregon. We want to again thank them for so many years of contributing to the club. Their tireless volunteering on club events and their willingness to help with any need that comes up, plus enjoying their happy faces and terrific attitude – they are prime examples of what our club is all about. We wish you the best in new pursuits in Oregon, but please come and see us as often as possible. Last, I wanted to ask all members, but especially those of you who are not often at the monthly dinner meetings, to let me know your thoughts about the dinner meetings. Specifically, what would you suggest we do differently with these dinner meetings that would make a difference for more of our members to attend. We are averaging about 25-30 members each month, but there are many of you who aren’t attending. We’d love to be in touch during these seven or eight months with everyone. Is it the venue? Is it the cost? Is it the timing? Is it the format for the meeting? I would greatly appreciate hearing from everyone on any changes that you would recommend that would lead to your being more likely to join us. You can email me at rogernewb@gmail.com. Or call if you like. And if you want to have your thoughts remain anonymous, I will gladly respect that. Yellow Fest is coming soon. Make plans and let’s see everyone there at Blake Island!! Reminder, we have two NEW menu choices, thanks to the team at IVAR’s Salmon House (see below). 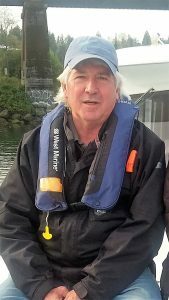 Steve Scherrer is joining us all the way from Ocean Park, WA and is going to show us how Paddle powered vessels (Canoes, Kayaks and SUPs – Stand up Paddleboards) can be a super friendly way to get out on the water and a great addition to bigger boats. REMEMBER: Please use the Comments box in your RSVP on Evite to advise how many people and which dinner menu choice each would like. Steve Scherrer started paddling a canoe in Boy Scouts in 1966 and has been in around and on boats ever since. With his wife, Cindy, he has lived on-board and sailed a number of sailboats over the years. He was a co-founder of Alder Creek Kayak and Canoe in Portland (1986-2004) He worked as a kayak designer and instructor for Confluence Watersports (2004-2014) and has spent the past five years traveling the country with his wife and dog, Piper, as SUP ambassadors and instructors representing a number of manufacturers. He is presently an American Canoe Association SUP and Kayak Instructor Trainer Educator. Paddle powered vessels (Canoes, Kayaks and SUPs – Stand up Paddleboards) can be a great way to get out on the water. Adding them to your yacht, as toys and transportation, is easy once you understand the basics. We’ll discuss many of the options available and look at the joys and challenges of each. 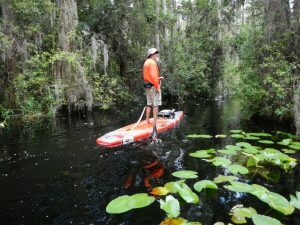 We’ll have an example of a highly portable, inflatable SUP to show off, and will go over some of the basics of paddling. Learn how Paddling and Yachting go hand in hand! Main course selections are due by 9:00 pm on Friday, April 12. Look for your Evite invitation in your email, then hit reply and use the comments field to tell me how many in your party and their dinner selections. Cancellations must be made by 9:00 pm April 12. July 31-Aug 1 – Summer Rendezvous, Reid Harbor, Stewart Is. Mark your calendars for these cruise weekends as they are not to miss events. 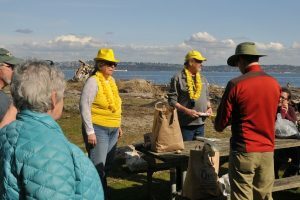 April 19 – 21 – Yellow Fest, at Blake Island. This weekend gives cruisers a chance to enjoy the Pacific NW outdoors, away from the city, no cars, sirens, or crowds, all within 90 minutes by boat. Jessie Lundin and Harold Baldwin will host this year’s Easter Egg hunt. Bring five small bottles of liquor for the hunt, and firewood for the fire in the pavilion, which SBYC has rented for the potluck on Saturday evening. Cruisers also bring a potluck dish to share. Cruisers get to Blake as early as Thursday because early birds can get a place at the dock with electricity, and can help bring other cruisers into dock space. No reservations can be made at Blake, so SBYC unofficially tries to keep us all together on the south docks. A Planning Committee for the June Dinner Dance will be held on Slow Dance, Saturday a.m., around 10:00. May 17 – 19 – Burger Burn, at Brownsville Marina. The cruise will be to Brownsville Marina this year, under the pavilion, a wonderful place to have a barbecue protected from the spring rains. Grills are available for cooking. A croquet game is planned for non-competitive cruisers to renew their coordination skills. Just kidding about the non-competitive; I challenge anyone to beat me. No prizes offered – just personal satisfaction. Marina reservations have been made, however, it is necessary to confirm one for your boat. Email Claudia@portabrownsville.org, or call 360 692 5498, to confirm your reservation. June 14 – 16 – June Dinner Dance at Kingston Cove Club House. The dance is on the third weekend of June, because of conflicts with race events on the second weekend. The dance is fun! The band, Malo Castro and his musicians are terrific, performing Latin American upbeat and danceable music. Last year everyone was dancing by the end of the evening. The Kingston Ale House will cater the entree; SYBYC is hosting the cocktail hour. Wine and beer are included in the ticket price. Confirm your boat reservations at the marina, (360) 297-3545. SBYC has reserved 10 for now. Let me know if there are any problems. More to come; I hope to see you on the water this year. Cruise Chair, cruisechair@shilsholebayyachtclub.org, or Patricia, (206) 356-3217. 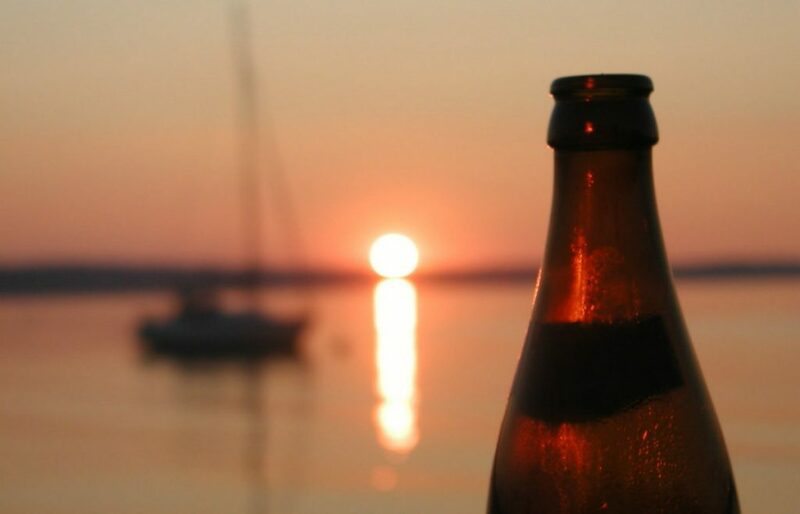 Just a friendly reminder that the SBYC Sails (& Ales)! event kicks off this month on Thursday the 25th. Mark your calendar and come join your fellow SBYC members on what I promise (fingers crossed) will be a beautiful warm sunny spring day. LOL let’s hope; if not, we’ll find a pub! Remember, all are welcome. You don’t have to have a boat, and feel free to invite prospective members too. We will meet at 4:30 around the picnic tables in front of the Shilshole Office to make a plan for the evening. Depending on how many people, boats (and what type), and the day’s weather we will decide what makes the most sense. It might be a quick jaunt across the Sound for dinner, a raft up, or a lazy sail around Meadow Point. If the weather is really crappy we will head to a pub and swap some good sailing stories over a pint. For communication we will use VHF channel 72 and the Slack app area called “# sails-and-ales.” If the weather is obviously really crappy check Slack for pub details (probably Ray’s). If you will be arriving late, post to Slack and we’ll work to figure something out so you can still participate. 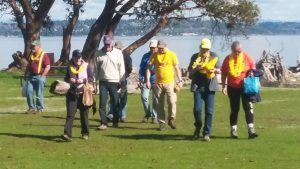 April 25th – 4:30pm in front of the Shilshole Office near the picnic tables. Sunset is 8:13 so we’ll plan to be off the water by then. Tentative plan is to sail a course from Shilshole to Point Jefferson and back.